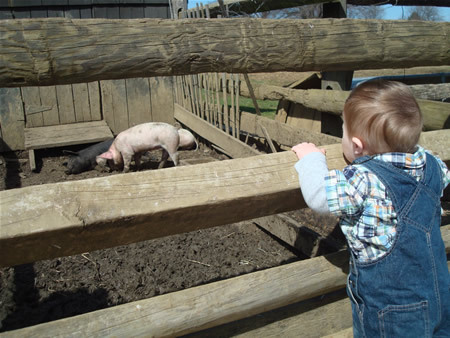 The sights, sounds, and smells of rural Monmouth County in the 1890s have been re-created on 9 acres at Historic Longstreet Farm in Holmdel Park, Holmdel. Interpreters in period dress show both daily and seasonal agricultural and domestic activities. 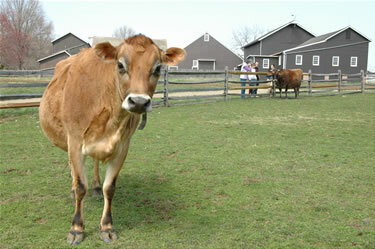 Longstreet Farm is open daily year round from 10 a.m.-4 p.m. Visitors may enter at their leisure, free of charge. 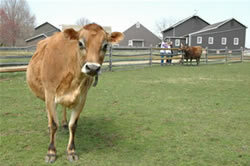 From Memorial Day through Labor Day the farm is open 9 a.m.-5 p.m. Pets are not allowed within the farm. Parent/Child Morning Chores program is offered from 8-9 a.m. the first Saturday of each month (except October). Open to ages 4 and up. Participants will help the farm staff milk a cow, collect eggs from the chickens, and feed the livestock. Program meets at the Longstreet Visitor Center. Please dress for the weather and wear closed-toe shoes. The cost is $15 per parent/child pair. $5 per additional participant. 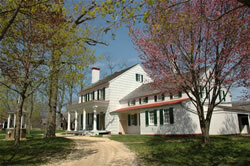 The Farmhouse is open weekends and holidays, March through December, from 12-3:30 p.m. or by reservation. For reservations and information, call 732-946-3758. Other points of interest: Tenant House - This building, across Longstreet Road, was home to the family that worked at Longstreet Farm. During the 1890s, the Hyland family, who emigrated from Ireland, were tenants on the farm. The house is now used for staff offices. c. 1850 with additions. Holmes-Hendrickson House - Nestled in a grove of trees, this historic museum is operated by the Monmouth County Historical Association. Built in 1754, it provides an excellent example of local Dutch building tradition and a glimpse into the county's colonial past. For information on tours and events, please visit the MCHA web site. The site is maintained as a living historical farm with the purpose of interpreting the agricultural activities in Monmouth County's rural past. This interpretation includes the breeds of animals and crops raised at this site in the 1890s. For your safety, as well as the safety of the animals, we ask that you do not touch or feed the animals. As a general precaution when leaving this site, you are encouraged to wash your hands with soap and water or alcohol-based hand sanitizer. 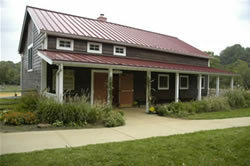 Longstreet Farm’s mission is to promote an appreciation for Monmouth County farm life at the end of the 19th century, preserving historic structures and practices through interpretive programs and tours. Livestock are an important component of this mission. The farm’s livestock are raised and cared for just as they were in the past – to meet the labor, food, and material needs of the farm. Mules and horses help plow the fields and harvest crops; dairy cows, chickens and pigs provide food to eat; and sheep are raised for meat and wool. The livestock are well cared for and receive modern veterinary visits to secure their good health and intended use. Periodically, the animals are bred to ensure the health of the historic breeds and to provide visitors with a realistic window into the life cycle of farm animals as it was in the 1890s and as it is today on thousands of small farms across the nation. Throughout the year, Longstreet Farm hosts free weekend activities that allow visitors to experience life as it would have been during the 1890s. For info on any of these events, call 732-946-3758. Sunday, May 12 from 1-3 p.m. Please check back for additional upcoming dates and other updates. Head to the blacksmith shop and see this skill in action. Saturday, April 27 from 11 a.m.-3 p.m.
Saturdays, May 11 & 25 from 11 a.m.-3 p.m.
Saturdays, June 8 & 22 from 11 a.m.-3 p.m.
Saturdays, July 6 & 20 from 11 a.m.-3 p.m.
Saturdays, August 3, 17 & 31 from 11 a.m.-3 p.m.
See what the farm staff is cooking on the wood-fired stove. Discover how recipes, cooking techniques and kitchens have changed since the 1890s. Saturday, May 18 from 1-3 p.m.
Saturday, June 15 from 1-3 p.m.
Saturday, July 13 from 1-3 p.m.
Saturday, August 17 from 1-3 p.m. Enjoy melodies of the 1890s played on the accordion while you visit the Longstreet farmhouse. demonstrate the way wool was used in Colonial America with spinning and weaving activities. 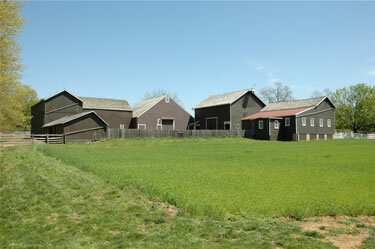 Longstreet Farm will provide wagon rides between the two living history sites. Saturday, May 4 from 1-3 p.m.
Visit the Longstreet farmhouse and view traditional hand quilting demonstration. Saturday, May 4 from 11 a.m.-3 p.m. Spend a summer afternoon at Holmdel Park and enjoy one of America’s favorite pastimes to see how it started. Monmouth Furnace Boys (formerly known as the Bog Iron Boys) will be playing vintage base ball, using rules from the 19th century. Players will be dressed in uniforms appropriate to the time period, and the style and terms of the 19th century are used during the game. Saturday, May 11 from 12-3 p.m. Enjoy learning how the carpenter uses 19th century woodworking and carving tools during this demonstration. Monday, May 27 from 12-3 p.m. This family holiday originated soon after the Civil War when women decided to decorate the graves of fallen soldiers. Today we call this special holiday Memorial Day. It was a time for family reunions and fun-filled visits. Join in the celebration as the staff of Longstreet Farm enjoys an old-fashioned Decoration Day. Saturday, June 1 from 1-3 p.m.
Colleen Minis will be demonstrating the forgotten art of smocking that was extensively used in the 18th and 19th century. Dorothy Gratton will visit Longstreet Farm and demonstrate the art of crochet and lacemaking in the Victorian era. Thursday, July 4 from 12-3 p.m. Independence Day was a festive time in the 1890s - patriotism was celebrated with music and games. Join the staff at Longstreet Farm as they celebrate the holiday with games and contests. Saturday & Sunday, July 6 & 7 from 12-2 p.m.
Take a step back in time and watch our antique threshing machine in action. The Longstreet Farm staff will use a 19th century, belt-driven Champion thresher to separate the wheat grain from the straw and the chaff. Learn how this important crop grows and see how it was processed in the days before modern combines. Joan Thalheimer will be demonstrating the art of making penny rugs. In the 1800s thrifty homemakers would use coin shaped fabric scraps of wool or felted wool from old clothing and blankets to create designs for mats or rugs. Saturday, August 10 from 12-3 p.m.
See how the carpenter uses 19th century woodworking and carving tools during this demonstration. Saturday & Sunday, August 17 & 18 from 12-2 p.m. Learn how potatoes were grown and harvested at the end of the 19th century. Help the Longstreet Farm staff bring in the crop, and dig some potatoes for your own family. Stop by the summer kitchen for some 19th century inspiration on how to prepare them at home. Saturday, August 24 from 1-3 p.m.
Visit the farmhouse and see the delicate craft of embroidery. An old-fashioned country fair reminiscent of the 1890s. It takes visitors back in time when neighbors gathered to accomplish work, harvest, and spend time socializing and enjoying each other’s company. It calls not only for the exhibition of the best products that have been grown and the best needlework that has been done in the community, but also for games, athletic contests and similar features of recreational or educational value. Admission and parking are free. For more information, please call 732-946-3758. Longstreet Farm has group activities covering a variety of topics relating to agricultural and social history. Click here for a listing. These programs have been developed for a wide range of age groups. There are fees for all programs listed. For additional information and registration, call 732-946-3758 or write to Longstreet Farm Programs, Monmouth County Park System, 805 Newman Springs Road, Lincroft, NJ 07738. Garden State Parkway to Exit 114. Southbound, turn right onto Red Hill Rd; northbound, turn left onto Red Hill Rd. Follow Red Hill Rd. to Everett Rd., turn right (heading west). Follow Everett Rd. to Roberts Rd., turn left. Follow Roberts Rd. to Longstreet Rd., turn right to Park on left.